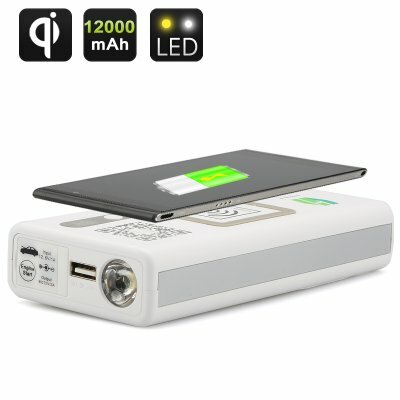 Successfully Added Multi-Functional Portable Power Bank - Wireless Charge, 12000mAh Capacity, Emergency Car Jump Starter Ability to your Shopping Cart. A great item to take with you in your car or in your rucksack is this multi-functional portable power bank pack. It has a 12000mAh High capacity lithium battery making it ideal for charging your products when you have not got a power socket available, plus it is capable of recharging more demanding devices such as laptops so you won’t have no excuse when your phone runs out of battery. Not only can your phone or laptop’s battery get a recharge but this power bank is capable of being used to jump start your vehicle’s big battery. It comes with the appropriate battery clips so you can make sure at least you have a good chance of getting home. The outputs and currents for this power pack are a DC 9V to 12V/2A and a USB 5V/2A port. You can also wireless charge any Qi charging products that you have such as a modern smartphone. By just laying your Qi charging standard compatible device on the Qi pad located on the top of the power bank, you can wireless charge without the need for cables. Not big and size and easy to store under the passenger seat or in the boot, this power bank with jump starter ability is a real winner. This product is in stock now, we guarantee next working day shipping and offer a 12 months warranty on all our products. Brought to you by the leader in electronic devices and wholesale car accessories, Chinavasion.